Ponyboy’s parents died in a car crash, and now he lives with his older brothers Darrel and Sodapop. The boys are in a gang of Greasers, letting their hair grow long and picking fights with the clean-cut Socs (short for Socials). The fights get violent, and Johnny, the smallest Greaser, gets swept up in the moment as he tries to keep a Soc from drowning Ponyboy. The two youngest Greasers get scared of the consequences and run away, starting a domino effect of events that will affect the whole gang. This is one of those books that all my friends had to read in high school, and I never did. Never had to, I mean - not that I skipped the assignment. And I’ll admit to skipping out on required reading! (Hemingway, I’m looking at you.) I heard a lot about this book, and it’s been referenced in everything pop culture, but I never read it. And honestly, now that I have… it wasn’t necessary to understand the references. The story was simple and has been redone and updated over time. It’s a simple story, and yes, it’s cool that the author, a girl!, wrote it when she was very young, but that’s been done throughout time, too. To be fair, it isn’t a BAD book. I read it all the way through, fairly quickly, and when I was done, I was done. Maybe that was some of the issue with me - I love when books, characters, or their problems stick with you. And that didn’t happen here. If I had read it in high school, I might be more attached to it. But at this point, I’m just glad to have read it and marked it off the list of books I “should” read. Many of S.E. Hinton’s characters make appearances in other books. 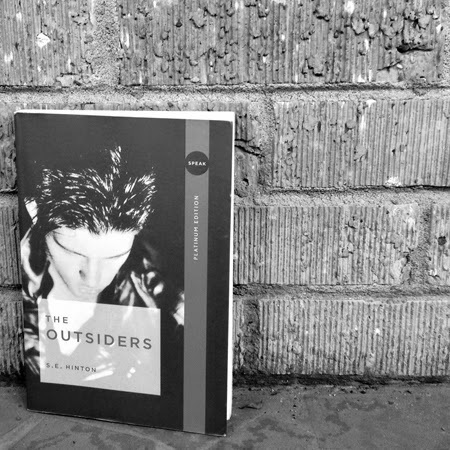 That Was Then, This Is Now is an epilogue to The Outsiders, set one year later. Tex in turn shows the adult lives of several characters from That Was Then, This Is Now.